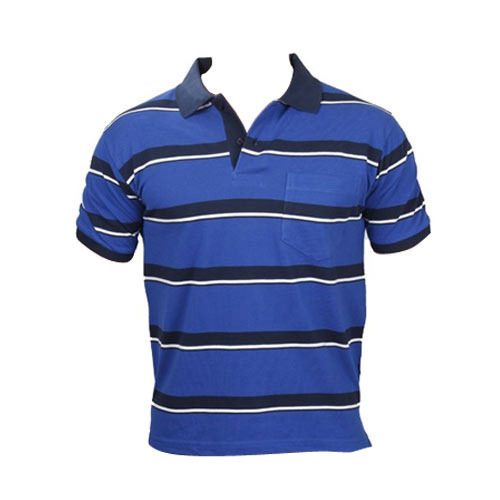 We are the prominent manufacturer and supplier of Pique Polo T Shirts. Known for its mesmerizing designs, accurate cuts and color combination's, this range of t-shirt is highly demanded in the market. Further, this t-shirt is designed as per the modern era that shows the wearer trendy and stylish in the crowd. In addition to this, our offered t-shirt is highly treasured by the clients for its comfortable stitching, shrink resistance, durability and perfect fit. Moreover, clients can avail this t-shirt from us at market leading prices. We are one of the prominent manufacturer and supplier of a wide collection of Knitted Fabrics and Garments. These include Jacquards Fabrics, Auto Stripes Fabrics, Single Jersey Fabrics, Lycra Fabrics, Single Jersey Polo T-Shirts, Round Neck T-Shirts, Lining T-Shirts, Printed T-Shirts, Sweat Shirts etc. Our Sister concern Pundrik Textile Mills Pvt. Ltd is one of the leading & excellent quality P/C (Polyester/Cotton) yarn producers located in Cotton growing belt in Northern part of India. Presently we are making Polyester/Cotton Combed yarn in counts 24s & 30s (Polyester 40% / Cotton 60% & Polyester 52% / Cotton 48% respectively ) meant for all types of knitting industry. Crafted with excellence, these knitted fabric and garments find a wide application in apparel industry. Our offered range is highly accepted due to its salient attributes like trendy design, attractive patterns, colorfastness, fine stitching, shrinkage resistance, soft & smooth texture and durability. These seamlessly designed knitted fabric and garments are available in plethora of patterns, colors and sizes to match-up with the on-going fashion trends.